Through the summer, we'll be featuring periodic reports from drum corps events and personalities from overseas. Helen Riley, the assistant drum major of the Stafford Lancers drum and trumpet corps from the West Midlands, England, sent in this report of what it's like to be in an English drum corps: "I have marched with the Stafford Lancers for eight years now. I was made assistant drum major to the drum major (Jason Howard) at the end of the last marching season after marching soprano for eight years, and for the last three years I have marched lead soprano with four solos in total and am playing my fifth this year. 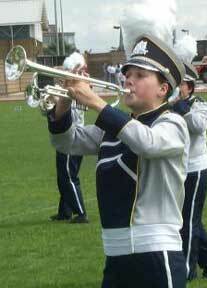 "Being made a drum major for the Stafford Lancers was a dream come true. I had wanted it for around the last three years but never had the chance, but because of the size of the band now, it was time to have two drum majors! Getting ready for the start of the season was the most hectic time for me. I had a lot of responsibilities to take on which I had never really faced until now. Sometimes I was on the podium, sometimes helping with drill, etc. Wherever and whenever I'm needed I have to be there, ready and prepared, which is quite scary in a way if I'm not 100 percent on what I'm doing or have never done it before, but the staff we have is great, so I don't usually have to much to worry about. "My "job description" and what I have to do was quite mind-blowing when I was first told, I wasn't expecting it to be such a demanding job, still not as demanding as some of the staffs jobs, but there's a big difference between this and being a soprano player on the field. "I love being a drum major obviously because I have wanted to do it for so long and it's a nice change after being out on the field for the last eight years. I feel like I get more out of it now as I have a lot more responsibility like teaching the lead sopranos during music rehearsals. I feel proud of my achievements. "The only down point, I must say, would be the late nights and early mornings during corps camps! I'm sure all other assistant drum majors out there would agree with me! "Apart from corps, my only other real commitments are college, where I am studying law after taking an advanced information technology course last year. I also work three evenings at Halford's Superstore in Stafford. "I'm really looking forward to the season; competitions are just the best thing ever, the adrenalin and the feeling of achievement, even when we don't do so well. We put a show out there and that takes time and effort, so all I ever aim for is to enjoy my time out there and not dwell on bad marks! Sometimes winning isn't everything, then again, sometimes it is!"